With marathon training programmes in full swing as well as the post Christmas exercise drives, the stretch of the week is the standing quad stretch. The quadriceps are the largest muscle group we have and generally get over-loaded as we push the weights, lunges, biking and running, and if you add to that the amount of sitting we do, these muscles can tighten up and could present us with various painful symptoms. Sore, clicky knees, painful hips, lower back pain can all be attributed to tight quads and hip flexors. The standing quad and hip flexor stretch can be done anytime, anywhere and if you are in the middle of an intense training should be done as much as possible, as all you need is a chair, bench or rock. Next week ill be showing you how to ice massage your pains away……brrrrrrr. 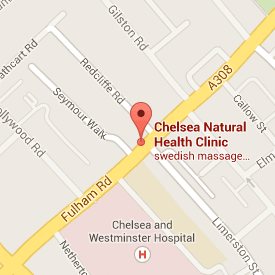 Sports Massage at Chelsea Natural Health Clinic. “You are an athlete, so treat and respect yourself like an athlete.”by Simon Heale at Chelsea Natural Health Clinic, 208 Fulham Road, SW10. The prime purpose of sports massage therapy is to help alleviate the stresses, tension and chemical by-products which build up in the body’s soft tissues during physical activity. 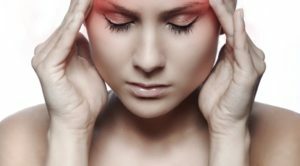 Where minor injuries and lesions occur, due to over-exertion and/or overuse, massage can break them down quickly and effectively. Above all, sports massage can help prevent those niggling injuries that so often get in the way of performance and achievement, whether one is an athlete, ardent keep fitter or a once a week jogger. Sports Massage is not just for the sports person: anyone can benefit from sports massage, including people in physically demanding jobs and those not quite so obvious, (occupational, emotional and postural stress may produce many similar characteristics to sports injuries). Compared to other forms of massage, Sports massage tends to be deeper and more intense. It is based on the various elements of Swedish massage and often incorporates a combination of other techniques involving stretching, compression, friction, toning, and trigger point response techniques similar to Acupressure and Shiatsu. As an experienced runner and therapist, I bring together this blend of techniques, knowledge and advice during treatment, to work effectively with the client to bring about optimum performance and to provide injury free training and minimise post event injuries. There are three areas where sports massage is used to benefit athletes and exercisers of all levels – Maintenance, Event and Rehabilitation. This is a regular massage treatment programme based on the therapists understanding of anatomy and of the muscles used in a given sport and which are likely candidates for trouble. By concentrating on particular muscle groups the therapist can help the client maintain or improve the range of motion and muscle flexibility, thereby reducing the risk of injury and increasing overall sustainability. Pre-event and post-event massage treatments are tailored for distinct purposes. Pre-event treatment is used as a supplement to an athletes warm-up to enhance circulation and reduce excess muscle and mental tension prior to competition. It is tailored to the needs of the athlete and his/her event and can be relaxing or stimulating as appropriate. Post-event massage, on the other hand, is geared towards reducing the muscle spasms and metabolic build-up that occur with rigorous exercise. Various sports massage techniques enhance the bodys own recovery process improving the athletes ability to return to training and competition, and reducing the risk of injury. Even with preventative maintenance, muscles cramp, tear, bruise, and aches, sports massage can speed healing and reduce discomfort during the rehabilitation process. The Soft tissue techniques I employ as a sports massage therapist are effective in the management of both acute and chronic injuries. Trigger point techniques reduce the spasm and pain that occur both in the injured and compensation muscles. Cross-fibre friction techniques can help with healing by the improved formation of strong and flexible repair tissue, which is vital in maintaining the full pain-free range of motion during rehabilitation. Further techniques I employ to assist the rehabilitation of injuries are Myo-fascial massage, Dry-Needling, Sports Taping and K-Taping. Nutritional and home-care advice is based on my own experiences as a runner as such are not prescribed. There is a lot of research that shows that stretching does not improve significantly sports performance or reduce the risk of injury. There is also a vast amount of research and literature that shows that regular stretching and mobilisation during a prolonged training schedule will reduce injury risks and I certainly subscribe to the latter. I have been advising and demonstrating stretches to my patients ever since I started as a therapist because it worked for me, as a runner and as a body-worker. I feel that advice can be taken far too rigidly and therefore I have to limit the exercises given to suit the individual concerned. Stretching, in my opinion, is not just a way to ease the muscle group back into a lengthened and toned state, but also to self-analyse or assess areas of tension or tightness. Stretching is a vital element of my approach as a Sports Massage Therapist. I can only do so much in one session, the stretching and remedial exercises are designed to continue the session until the next treatment. These stretches are not just for runners, they are for anyone using their muscles regularly. The general rule is if you have an acute injury (first 48 hours) and inflammation, swelling and bruising is present , then applying cold to the area will help reduce the body’s zealous inflammatory response. Heat can be used to increase circulation to an area that feels stiff and tender, especially if it has been present over 48 hours. These are general rules which means that if one doesn’t help, try the other. For runners and for sports people involved in endurance and power exercising I recommend ice-baths after the long runs or hard training sessions. In my opinion and experience, and it is something you have to try for yourself, a cold bath or brief shower on the legs helps blood get to the deeper areas of the muscles, away from the surface areas, not only soothing any inflamed areas but helping the deeper muscle fibres to recover quicker. Try it after your long run and see. Your body is nourished, cleansed and maintained by your blood and lymph systems. Pumped by your heart, your blood circulates oxygen and nutrients to your muscles, where they are converted in to energy. A by product of this process is lactic acid, which is filtered out with toxic wastes and carried away by your lymph system – the same miraculous ‘sanitary system’ that is in charge of your immunity, protecting you from disease. When activity becomes strenuous, however, this process loses its efficiency. Energy requirements exceed supply, and your feel it when the force of your swing at a tennis ball, for instance, isn’t as hard after two hours of play as it was when you started. A similar problem occurs with too little activity – when you’re at your desk too long and find your mind slower, your irritation higher, and tension grabbing your neck and shoulders. In both cases, lactic acid accumulates. Your muscles become cramped and sluggish. Blood and lymph flow decrease, and fatigue sets in. Rest is your body’s natural means of recuperation. It takes time, as you know, and in the active, demanding pace of life today, there is rarely enough time for sufficient rest. The result is that the damaging effects are compounded, day after day, affecting not only the way you feel and function, right now but also your future well-being. Rest is the one word that in my experience as a runner and as a therapist, people just don’t get. Asking a runner to rest more is like asking them to not think about running for a day, or worse, to not run for a day. The problem I have found is that when people have a training schedule, the tendency is to stick to it rigidly, and this is where problems can occur. We, I include myself (the old self, not the new, more insightful me) regard rest as a day wasted, where we could or rather should be training. The result is often illness or an over-use injury. Rest is simply the time when the body recovers, tries to heal and most important of all, gets stronger. Crazy, I know, but by giving our systems the time-out it deserves, we get to feel and see the benefit of all the training. Rest can be used as just a change from the dominant activity, so instead of running, you cycle: its still exercise. Rest should mean rest. Either just putting your feet up, catching up on the sleep your body needs, having a relaxing Epsom Salt bath or getting a Sports Massage. Treat your body well and it will treat you well and sustain you for longer. Abuse your body, and you will know soon enough. Injuries don’t just happen, there are always good reasons for them and my role as an experienced runner and Sports Massage Therapist is to not only treat the presenting symptoms, but to identify the behaviours leading to the injury, possible muscular-skeletal imbalances and to alter the clients approach to their exercise and to themselves. So a Sports Massage is not just a deep-tissue massage, it is an opportunity to find out what, if anything, is not working for you regarding your training or goals, and to put in place an effective strategy to get you to the start-line in a healthy frame of body and mind. Alongside Sports Massage, I regularly employ Sports and Performance Hypnotherapy, Performance Coaching, Pilates Postural Correction exercises and my legendary blue-shorted Stretches for Runners.